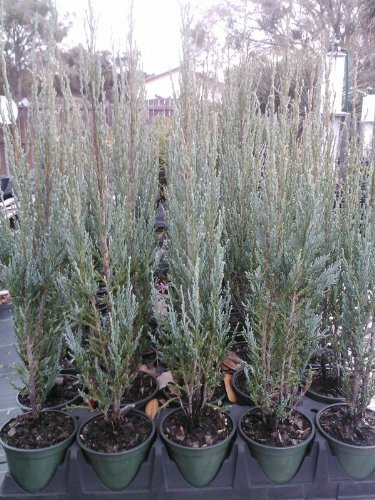 Sandys Nursery Online Juniper 'Skyrocket' Shrub/Evergreen Fast Grower! 4 inch pot ~Lot of 30~ by Sandys Nursery Online at Tulips Orchids. Hurry! Limited time offer. Offer valid only while supplies last. Ships: (30) 4 inch pot with soil, 12+ inches tall. Each plant is individually wrapped for protection. Sorry, we do not ship to AZ or this item to CA. Ships: (30) 4 inch pot with soil, 12+ inches tall. Each plant is individually wrapped for protection. Sorry, we do not ship to AZ or this item to CA. Juniper: Skyrocket Juniperus scopulorum Growth Habit: Narrow Columnar evergreen tree. Foliage: Blue- green. Mature Height: 15-18 feet. Mature Width: 2-3 feet. Spacing: 2 feet apart privacy screen. Growth Rate: Moderate to Fast 1-2 feet per year once well established. Sun Exposure: Full sun. Soil Conditions: Prefers well-drained soil; adaptable to a wide range of soil conditions. Tolerances: Drought once well established & high levels of pollution and salt spray. Pruning/Trimming: Trimmed to a desired height and/or sheared in the fall, but not necessary. Fertilizer: Suggest a well-balance fertilizer like a 10-10-10 or 13-13-13. Feed in spring and fall. Uses: Decorative accent and ideally for wind or privacy screen. Moisture: Regular water schedule the first few growing season until well established. Once established water maybe needed occasionally, but more often during a drought or extreme heat conditions. Mulching is recommended to detour weeds, keep the moisture content high, and temperatures low. Hardiness Zone: 4-9. Sorry, we do not ship to Arizona or this item to California at this time. Sandys Nursery Online TM favorite evergreen! Ships: (30) 4 inch pot with soil, 12+ inches tall. Each plant is individually wrapped for protection. Sorry, we do not ship to AZ or this item to CA. If you have any questions about this product by Sandys Nursery Online, contact us by completing and submitting the form below. If you are looking for a specif part number, please include it with your message.